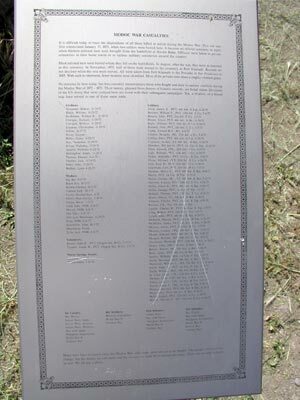 It is difficult today to trace the dispositions of all those killed in action during the Modoc War. This site was first consecrated January 17, 1873, when two soldiers were buried here. It became an official cemetery in April when thirteen enlisted men were brought from the battlefield at Hardin Butte. Officers were taken to private cemeteries in their home towns or to various military cemeteries around the country. Most enlisted me were buried where they fell on the battlefields. In August, after the war, they were re-interred in this cemetery. In November, 1875, half of them were moved to the cemetery at Fort Klamath. Records do not disclose when the rest were moved. All were taken from Fort Klamath to the Presidio in San Francisco in 1885. With each re-interment, fewer remains were identified. Most of the privates now share a single, common grave. No remains lie here today, but this cemetery memorializes those who fought and died in various conflicts during the Modoc War of 1872-1873. Their names, gleaned from dozens of historic records, are listed below. Divisions of the US Army that were camped here are listed with their subsequent campaigns. You, a relative, or a friend may have served in one these same units. Many wars have occurred since the Modoc War, and many more are yet to be fought. The people involved may change, but the names we call them and the reasons we fight them remain the same. There are no true winners in war. We all pay a price. 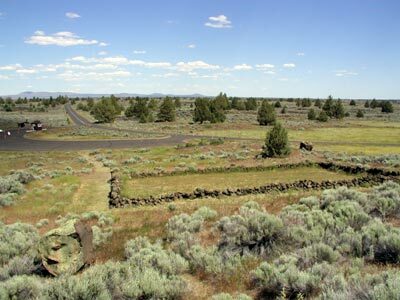 Lava Beds National Monument, 7.5 mi W of NE entrance, 4 mi S of Tule Lake. Return to other landmarks in Siskiyou county.